Background/Aims: Although endoscopic metal biliary endoprosthesis (EMBE) is widely accepted as the most suitable drainage method for patients with unresectable malignant obstruction, uncontrolled post-procedural cholangitis is still a problem. We aimed to validate a new treatment modality to prevent post-ERCP cholangitis in patients with unresectable cholangiocarcinoma. Patients and Methods: A total of 378 patients who were diagnosed with unresectable malignant biliary obstruction and underwent EMBE or temporary endoscopic nasobiliary drainage (ENBD) following EMBE placement, from January 2010 to July 2016, were enrolled in this retrospective study. Incidence of cholangitis, related infectious indicators, success rate of biliary drainage, and occurrence of complications were evaluated. Results: The risk of overall cholangitis and related infectious indicators was significantly lower in EMBE plus ENBD group than that in EMBE group. The occurrence of cholangitis was 2.4% versus 11.9% (P = 0.004). On further analysis of subgroups, although no difference was detected in nonhilar cholangiocarcinoma subgroup, the incidence of cholangitis and related infectious indicators in hilar cholangiocarcinoma subgroup with EMBE modality were distinctly higher than that with EMBE plus ENBD modality (type I + II was 18.5% vs 0%, P < 0.05; type III + IV was 19.8% vs 3.8%, P < 0.05). No significant difference was found in successful biliary drainage rate and procedure-related complications when all subgroups were compared. Conclusions: The temporary placement of ENBD following EMBE is a simple and effective treatment modality to prevent post-ERCP cholangitis, especially in patients with hilar cholangiocarcinoma. Cholangiocarcinoma, especially the hilar cholangiocarcinoma, is a common cause of malignant biliary obstruction in Southeast Asia. Due to nonspecific early symptoms, the great a majority of patients are detected at an advanced stage of the disease. Therefore, the prognosis of cholangiocarcinoma is very poor and less than 20% of patients are suitable for curative resection., These symptomatic patients who are not eligible for surgical resection might have to be treated with a palliative biliary drainage with endoscopic biliary drainage (EBD) or percutaneous transhepatic biliary drainage (PTBD). Palliative biliary drainage helps alleviate jaundice, decompress the pressure of biliary tract, ameliorate the liver function, and prolong life expectancy. 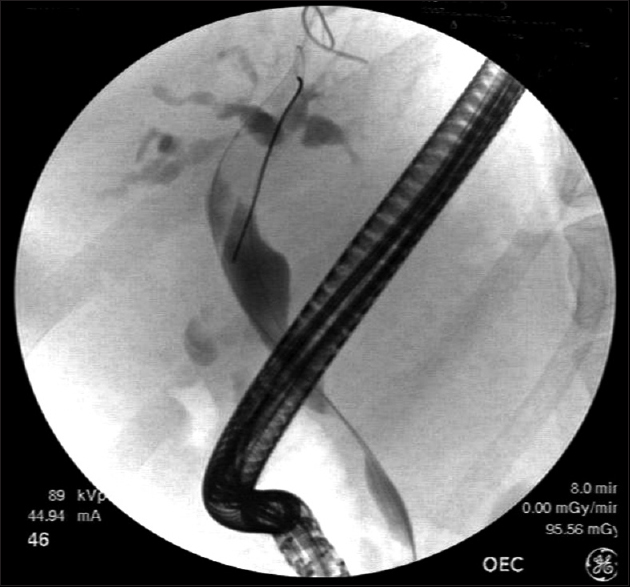 In the last decade, with remarkable advances in endoscopic technique, the endoscopic retrograde cholangiopancreatography (ERCP) technique combined with biliary stenting is increasingly accepted as the mainstay palliative drainage appoach, which is less invasive, more comfortable, with shorter hospital stay than percutaneous drainage., Compared with plastic stent, the self-expandable metal stent (SEMS) has been widely utilized for its advantages of longer patency and fewer reinterventions to alleviate obstructive symptoms and improve quality of life., However, uncontrolled cholangitis after endoscopic metal biliary endoprosthesis (EMBE) is still a thorny problem, which has been shown to be a risk factor for early mortality after ERCP. Hence, it remains a pivotal concern to explore new methods to prevent postoperative cholangitis. Based on the above knowledge, we attempted to temporarily place a nasobiliary catheter with a negative pressure device following metal stenting to increase bile drainage, decompress upstream bile duct over the obstruction and decrease the incidence of post-procedure cholangitis. To the best of our knowledge, few studies involving combination of EMBE and ENBD to prevent postoperative cholangitis have been reported. In this study, we aimed to evaluate the efficacy of temporary placement of ENBD following EMBE to prevent post-ERCP cholangitis in patients with unresectable cholangiocarcinoma. A total of 378 consecutive patients, who were diagnosed with unresectable cholangiocarcinoma [Table 1] and who had undergone EMBE or EMBE plus ENBD treatment, were enrolled in this retrospective analysis at Shanghai General Hospital during the periods January 2010–July 2016. The participants were divided into EMBE group and EMBE plus ENBD group, depending on whether a nasobiliary drain was placed following metal stenting. The diagnosis and assessment of patients was based on an endoscopic database that combined the clinical findings, laboratory investigations, and radiological studies including computed tomography (CT) scan, magnetic resonance cholangiopancreatography (MRCP), endoscopic ultrasonography (EUS), etc. The patients with post-ERCP pancreatitis were excluded to eliminate confounding factor of infection. The study protocol was approved by the ethical committee of the Institutional Review Board of Shanghai General Hospital. The characteristics of patients including age, gender, biochemical indicators, and hematological values were collected pre- and post-ERCP. All procedures were carried out by one of two experienced endoscopists under conscious sedation by using intravenous midazolam and pethidine. ERCP was performed in prone position with conventional therapeutic duodenoscopy (TJF-260V, Olympus, Tokyo, Japan). The common bile duct was cannulated through the duodenal papilla. If biliary cannulation was difficult, a pre-cut or endoscopic sphincterotomy (EST) was performed. The location and length of stricture and the change of intrahepatic duct could be observed carefully through slow injection of low osmolar, nonionic contrast medium called Ultravist [Figure 1] and [Figure 2]. 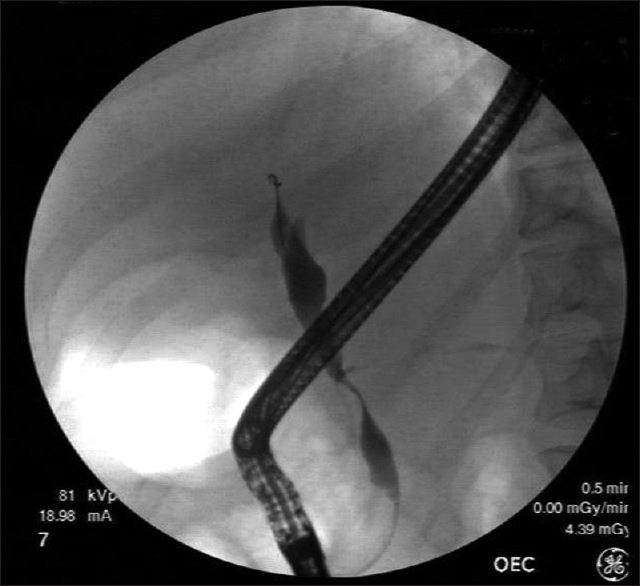 Endoscopists placed the appropriate metal stents in the optimal location of bile duct guided by fluoroscopy [Figure 3]. 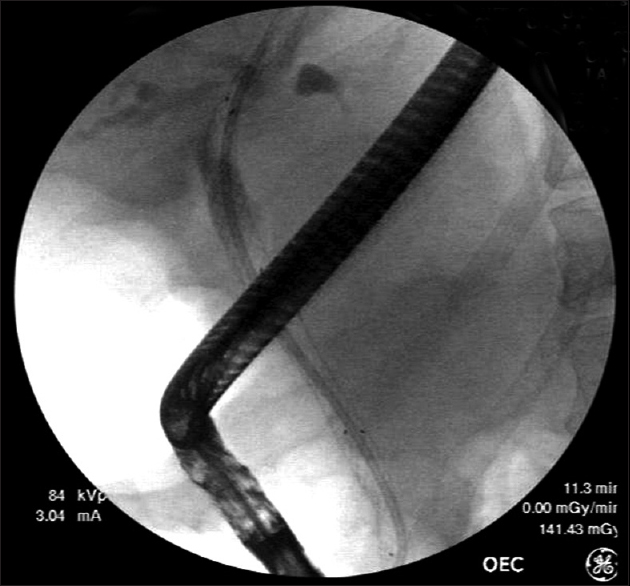 In patients of EMBE plus ENBD group, the nasobiliary catheter with vacuum device was inserted and traversed the stricture when bile or contrast medium drained incompletely after insertion of metal stents [Figure 4] and [Figure 5]. Patients with hilar cholangiocarcinoma were administrated with intravenous broad-spectrum prophylactic antibiotics. The nasobiliary catheter was removed after 24 h if no cholangitis was observed. In this study, the main endpoint assessment was the effectiveness of preventing cholangitis. To compare the variables of the two groups, the Chi-square tests or Fisher's exact tests were applied to analyze the categorical variables described in terms of counts and percentages. Two-sample t-tests were used to analyze continuous variables described as the mean ± standard deviation. Statistical analysis was conducted with SPSS 22.0 software (SPSS Inc., Chicago, IL, USA). The level of significance was set at a P value < 0.05. As shown in [Table 2], a total of 378 patients, 252 patients with EMBE and 126 patients with EMBE plus ENBD, were enrolled in this study. Among these patients, 216 patients were diagnosed with hilar cholangiocarcinoma, with 140 in EMBE group and 76 in EMBE plus ENBD group. The remaining 162 patients were diagnosed with non-hilar cholangiocarcinoma, with 112 in EMBE group and 50 in EMBE plus ENBD group. The demographic features, infectious indicators, tumor markers, and liver function tests between the two groups showed no significant difference prior to the procedure. The comparison of the two groups indicated that incidence rate of cholangitis and related infectious indicators were significantly higher in EMBE group than that in EMBE plus ENBD group. Cholangitis occurred in 30 patients in EMBE group and in 3 patients in the EMBE plus ENBD group (11.9%, 30/252 vs 2.4%, 3/126, P = 0.004). 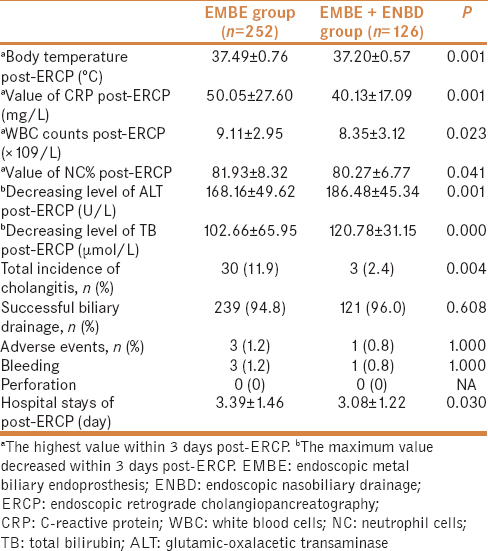 The mean CRP after ERCP was 50.05 mg/L in EMBE group and 40.13 mg/L in EMBE plus ENBD group (P = 0.001), and WBC counts were 9.11 ± 2.95 × 109/L in EMBE group and 8.35 ± 3.12 × 109/L in EMBE plus ENBD group (P = 0.023). Successful biliary decompression was achieved in 239 of 252 patients (94.8%) in EMBE group and in 121 of 126 patients (96.0%) in EMBE plus ENBD group (P = 0.608). Moreover, there was no significant difference in rate of adverse events, 1.2% (3/252) in EMBE group and 0.8% (1/126) in EMBE plus ENBD group (P = 0.652). Three patients in EMBE group (1.2%) and one patient in EMBE plus ENBD group (0.8%) developed post-ERCP bleeding (P = 1.000). No perforation and immediate death occurred in any of the 378 patients. The mean hospital stay of post-ERCP demonstrated significant difference in the comparison of the two groups (3.39 days in EMBE group vs 3.08 days in EMBE plus ENBD group, P = 0.03), as shown in [Table 3]. Further analysis of subgroups is indicated in [Table 4]. One hundred and sixty two of the 378 patients were diagnosed with non-hilar cholangiocarcinoma, with 112 patients in EMBE group and 50 patients in EMBE plus ENBD group. There were no significant differences regarding drainage success rate, incidence of cholangitis, and related infectious indicators including WBC counts, CRP value, and temperature. The remaining 216 patients were identified as hilar cholangiocarcinoma, among which 140 patients (54 patients with type I + II and 86 patients with III + IV) were treated with EMBE and 76 patients (24 patients with type I + II and 52 patients with type III + IV) were treated with EMBE plus ENBD. In patients with hilar cholangiocarcinoma (including type I + II and III + IV), incidence of cholangitis and related infectious indicators differed significantly in comparison of EMBE group and EMBE plus ENBD group. Incidence of cholangitis was 18.5% (10/54) versus 0% (0/24) in type I + II (P < 0.05), and 19.8% (17/86) versus 3.8% (2/52) in type III + IV (P < 0.05). Mean CRP was 52.11 ± 13.96 mg/L versus 41.20 ± 9.57 mg/L in type I + II (P < 0.01), and 69.81 ± 11.75 mg/L versus 53.13 ± 9.10 mg/L in type III + IV (P < 0.001). Moreover, the mean hospital stay was significantly longer in EMBE group than that in EMBE plus ENBD group both in type I + II and in type III + IV (in type I + II: 3.58 days vs 3.13 days, P = 0.033; in type III + IV: 4.80 days vs 4.06 days, P = 0.000). Nevertheless, there was no significant difference in incidence of complications in all subgroups. As we currently understand, cholangiocarcinoma, which mainly presents with progressive jaundice, is one of the most common cancers throughout the world and has particularly high prevalence in certain Asian countries, such as Thailand and China. Unfortunately, a majority of patients with cholangiocarcinoma are found and diagnosed at a stage when curative resection is impossible. Therefore, palliative care using a minimally invasive, endoscopic procedure is the most promising option for these patients. Multiple clinical studies indicate that EMBE, which is associated with higher successful drainage (more than 90% efficacy) and lower rate of occlusion than plastic stents, has been performed as a preferred endoscopic technique for patients with advanced malignant biliary obstruction.,,,,,,, However, it is far from optimal for patients with unresectable cholangiocarcinoma because of the intractable postoperative cholangitis, a high risk factor of mortality. Clinically, multiple risk factors could be associated with postoperative cholangitis. For example, over injection of contrast agents would be very difficult to be drained when it gets into an obstructed intrahepatic bile duct resulting in cholangitis; lack of sterile manipulation results in bacteria being transported into the biliary tract inadvertently; operations such as endoscopic sphincterotomy, pre-cut papillotomy, endoscopic papillary balloon dilation and multiple cannulation attempts induce duodenal papilla edema and reflux of intestinal contents.,, In view of these risk factors, the endoscopists often perform the procedure cautiously by injecting less contrast agents, shortening operative time, and avoiding unnecessary manipulation as much as possible. However, post-ERCP cholangitis is still unavoidable. Therefore, we attempted to deploy a nasobiliary catheter with negative pressure drainage device after placement of metal stents in an effort to decrease the incidence of cholangitis. Although it remains a matter of debate in the West regarding its discomfort for patients, a number of endoscopists prefer nasobiliary drainage for management of acute cholangitis and prevention of pancreatitis.,,, As a negative pressure drainage device, nasobiliary drainage has the following advantages. 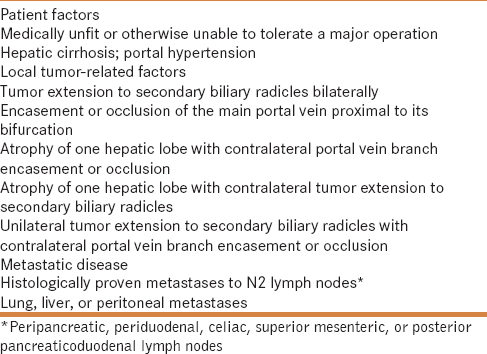 First, in patients with advanced hilar cholangiocarcinoma (especially Bismuth types III and IV), the obstructive sites are often located in multiple biliary branches and most of those have no communication with each other, thus making it impossible to overcome all obstructions with one or two stents. In this situation, it is difficult to distinguish between acute cholangitis in a previously drained branch due to stent occlusion, and a previously undrained biliary branch. The nasobiliary tube, with multiple lateral holes as well as negative pressure aspiration device, could successfully perform the drainage of retained bile and contrast agents. Second, it enables evaluation of quality and quantity of drained bile and facilitates the collection of a bile sample for bacterial culture, which can give accurate direction for antibiotic administration. Third, negative pressure suction reduces the infectious opportunity induced by reflux of intestinal contents. In addition, it makes it convenient to perform follow up cholangiography and maintain patency by lavage. Furthermore, nasobiliary drainage can also decompress the pressure of biliary tract, keep the pancreatobiliary common channel patency, and decrease incidence of post-ERCP pancreatitis. To the best of our knowledge, this is the first report on the efficacy of temporary placement of ENBD following EMBE to prevent post-ERCP cholangitis in patients with unresectable cholangiocarcinoma. With the understanding that long-term placement is associated with patient discomfort and complications, we chose temporary placement of ENBD for 24 h with the goal to reduce the occurrence of procedure-related cholangitis. In the present retrospective study, we found that EMBE plus ENBD modality can remarkably lower the incidence of post-ERCP cholangitis when compared with EMBE modality alone. Further analysis in subgroups of hilar cholangiocarcinoma showed that the incidence of procedure-related cholangitis, infectious indicators, values of liver function, and post-procedure hospital stays were also significantly decreased by EMBE plus ENBD treatment (especially in types III and IV). 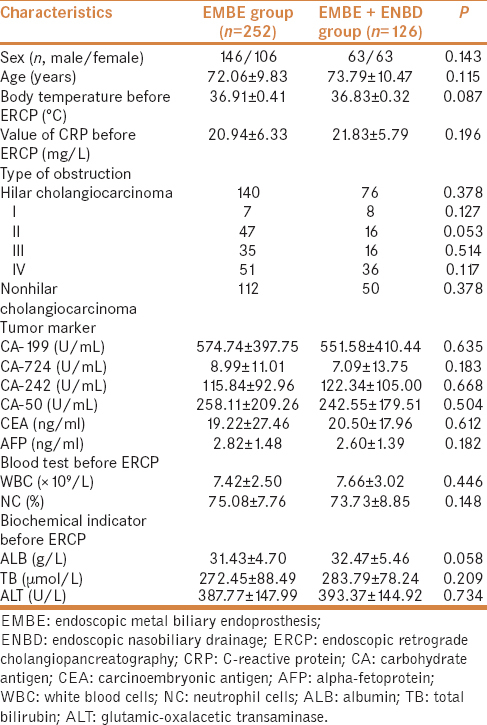 Nevertheless, these differences were not detected in patients with non-hilar cholangiocarcinoma. In conclusion, temporary placement of ENBD following EMBE shows promise as a safe and feasible treatment modality for patients with unresectable hilar cholangiocarcinoma. Simultaneously, the study also indicated it may be unnecessary to place ENBD in patients with non-hilar cholangiocarcinoma. Nevertheless, there are several limitations to this study, including the retrospective design, lack of randomization, and the evaluation of subjects from a single center, which may limit our ability to assess the treatment efficacy objectively and exclude potential bias. Further prospective and randomized-controlled experiments should be considered. This study was funded by the National Natural Science Foundation of China (No. 81572316), the Natural Science Foundation of Shanghai (No. 14411966900), and the Medicine and Engineering Crossover Research Foundation (YG2014MS24). JuttijudataP, Chiemchaisri C, Palavatana C, Churnratanakul S. Causes of cholestasis in Thailand. A study of 276 consecutive patients. Am J Surg 1984;147:360-6. Nakeeb A, Pitt HA, Sohn TA, Coleman J, Abrams RA, Piantadosi S, et al. Cholangiocarcinoma. A spectrum of intrahepatic, perihilar, and distal tumors. Ann Surg 1996;224:463-73; discussion 73-5. 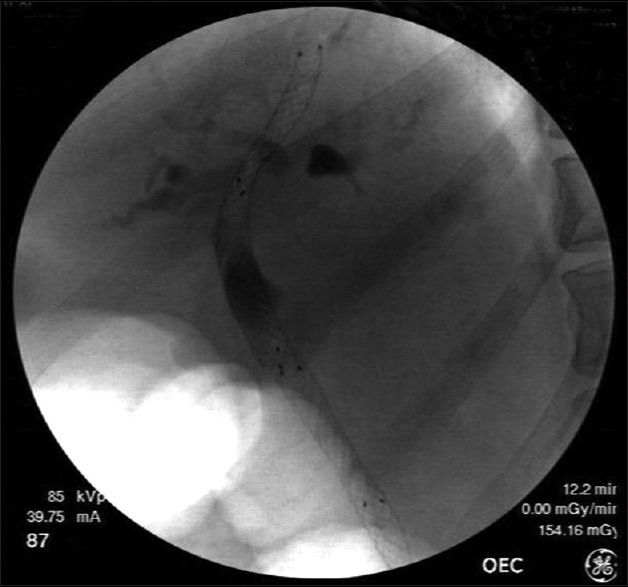 Cheng JL, Bruno MJ, Bergman JJ, Rauws EA, Tytgat GN, Huibregtse K. Endoscopic palliation of patients with biliary obstruction caused by nonresectable hilar cholangiocarcinoma: Efficacy of self-expandable metallic Wallstents. Gastrointest Endosc 2002;56:33-9. Sangchan A, Kongkasame W, Pugkhem A, Jenwitheesuk K, Mairiang P. Efficacy of metal and plastic stents in unresectable complex hilar cholangiocarcinoma: Arandomized controlled trial. Gastrointest Endosc 2012;76:93-9. Kawakami H, Kuwatani M, Onodera M, Haba S, Eto K, Ehira N, et al. Endoscopic nasobiliary drainage is the most suitable preoperative biliary drainage method in the management of patients with hilar cholangiocarcinoma. J Gastroenterol 2011;46:242-8. Takahashi Y, Nagino M, Nishio H, Ebata T, Igami T, Nimura Y. Percutaneous transhepatic biliary drainage catheter tract recurrence in cholangiocarcinoma. Br JSurg 2010;97:1860-6. Mukai T, Yasuda I, Nakashima M, Doi S, Iwashita T, Iwata K, et al. Metallic stents are more efficacious than plastic stents in unresectable malignant hilar biliary strictures: Arandomized controlled trial. J Hepatobiliary Pancreat Sci 2013;20:214-22. Budzynska A, Nowakowska-Dulawa E, Marek T, Hartleb M. Comparison of patency and cost-effectiveness of self-expandable metal and plastic stents used for malignant biliary strictures: APolish single-center study. Eur J Gastroenterol Hepatol 2016;28:1223-8. Vienne A, Hobeika E, Gouya H, Lapidus N, Fritsch J, Choury AD, et al. Prediction of drainage effectiveness during endoscopic stenting of malignant hilar strictures: The role of liver volume assessment. Gastrointest Endosc 2010;72:728-35. Kapral C, Duller C, Wewalka F, Kerstan E, Vogel W, Schreiber F. Case volume and outcome of endoscopic retrograde cholangiopancreatography: Results of a nationwide Austrian benchmarking project. Endoscopy 2008;40:625-30. Kiriyama S, Kozaka K, Takada T, Strasberg SM, Pitt HA, Gabata T, et al. Tokyo Guidelines 2018: Diagnostic criteria and severity grading of acute cholangitis (with videos). J Hepatobiliary Pancreat Sci 2018;25:17-30. Cote GA, Sherman S. Advances in pancreatobiliary endoscopy. Curr Opin Gastroenterol 2010;26:429-35. Chung KH, Lee SH, Park JM, Lee JM, Ahn DW, Ryu JK, et al. Self-expandable metallic stents vs plastic stents for endoscopic biliary drainage in hepatocellular carcinoma. Endoscopy 2015;47:508-16. Cho HC, Lee JK, Lee KH, Lee KT, Paik S, Choo SW, et al. Are endoscopic or percutaneous biliary drainage effective for obstructive jaundice caused by hepatocellular carcinoma? Eur J Gastroenterol Hepatol 2011;23:224-31. Hong HP, Kim SK, Seo TS. Percutaneous metallic stents in patients with obstructive jaundice due to hepatocellular carcinoma. J Vasc Interv Radiol 2008;19:748-54. Shin HR, Oh JK, Masuyer E, Curado MP, Bouvard V, Fang YY, et al. Epidemiology of cholangiocarcinoma: An update focusing on risk factors. Cancer Sci 2010;101:579-85. Goenka MK, Goenka U. Palliation: Hilar cholangiocarcinoma. World J Hepatol 2014;6:559-69. Elwir S, Sharzehi K, Veith J, Moyer MT, Dye C, McGarrity T, et al. Biliary stenting in patients with malignant biliary obstruction: Comparison of double layer, plastic and metal stents. Dig Dis Sci 2013;58:2088-92. Davids PH, Groen AK, Rauws EA, Tytgat GN, Huibregtse K. Randomised trial of self-expanding metal stents versus polyethylene stents for distal malignant biliary obstruction. Lancet 1992;340:1488-92. Choi JM, Kim JH, Kim SS, Yu JH, Hwang JC, Yoo BM, et al. A comparative study on the efficacy of covered metal stent and plastic stent in unresectable malignant biliary obstruction. Clin Endosc 2012;45:78-83. Moses PL, Alnaamani KM, Barkun AN, Gordon SR, Mitty RD, Branch MS, et al. Randomized trial in malignant biliary obstruction: Plastic vs partially covered metal stents. World J Gastroenterol 2013;19:8638-46. Raju RP, Jaganmohan SR, Ross WA, Davila ML, Javle M, Raju GS, et al. Optimum palliation of inoperable hilar cholangiocarcinoma: Comparative assessment of the efficacy of plastic and self-expanding metal stents. Dig Dis Sci 2011;56:1557-64. Chahal P, Baron TH. Expandable metal stents for endoscopic bilateral stent-within-stent placement for malignant hilar biliary obstruction. Gastrointest Endosc 2010;71:195-9. Paik WH, Park YS, Hwang JH, Lee SH, Yoon CJ, Kang SG, et al. Palliative treatment with self-expandable metallic stents in patients with advanced type III or IV hilar cholangiocarcinoma: Apercutaneous versus endoscopic approach. Gastrointest Endosc 2009;69:55-62. Stefanidis G, Viazis N, Pleskow D, Manolakopoulos S, Theocharis L, Christodoulou C, et al. Large balloon dilation vs. mechanical lithotripsy for the management of large bile duct stones: Aprospective randomized study. Am J Gastroenterol 2011;106:278-85. Boender J, Nix GA, de Ridder MA, van Blankenstein M, Schütte HE, Dees J, et al. Endoscopic papillotomy for common bile duct stones: Factors influencing the complication rate. Endoscopy 1994;26:209-16. Ikeda S, Tanaka M, Matsumoto S, Yoshimoto H, Itoh H. Endoscopic sphincterotomy: Long-term results in 408 patients with complete follow-up. Endoscopy 1988;20:13-7. Park SY, Park CH, Cho SB, Yoon KW, Lee WS, Kim HS, et al. The safety and effectiveness of endoscopic biliary decompression by plastic stent placement in acute suppurative cholangitis compared with nasobiliary drainage. Gastrointest Endosc 2008;68:1076-80. Lee JK, Lee SH, Kang BK, Kim JH, Koh MS, Yang CH, et al. 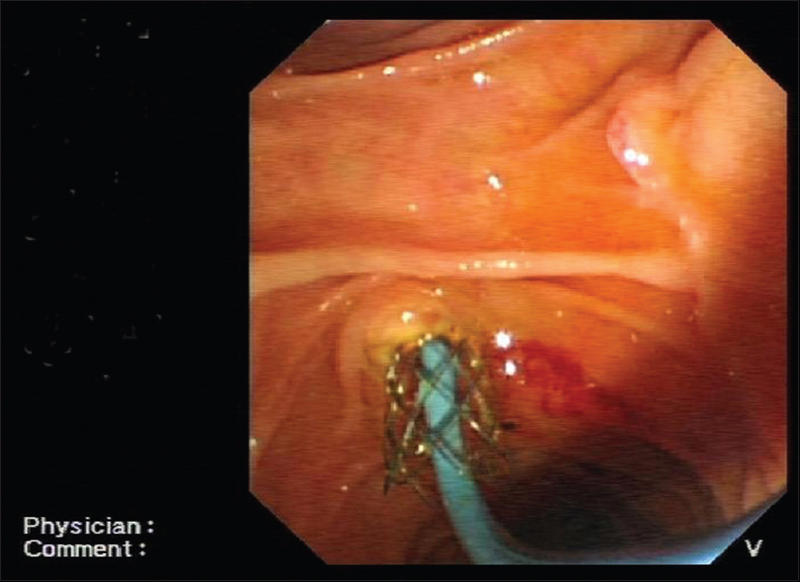 Is it necessary to insert a nasobiliary drainage tube routinely after endoscopic clearance of the common bile duct in patients with choledocholithiasis-induced cholangitis? A prospective, randomized trial. Gastrointest Endosc 2010;71:105-10. Yoo KS, Lehman GA. Endoscopic management of biliary ductal stones. Gastroenterol Clin North Am 2010;39:209-27, viii. Tsuyuguchi T, Takada T, Kawarada Y, Nimura Y, Wada K, Nagino M, et al. Techniques of biliary drainage for acute cholecystitis: Tokyo Guidelines. J Hepatobiliary Pancreat Surg 2007;14:46-51. Kawakubo K, Isayama H, Mizuno S, Hirano K, Yamamoto N, Takahara N, et al. One-step, simultaneous triple endoscopic nasobiliary drainage for hilar biliary stricture. Dig Endosc 2013;25:76-9.